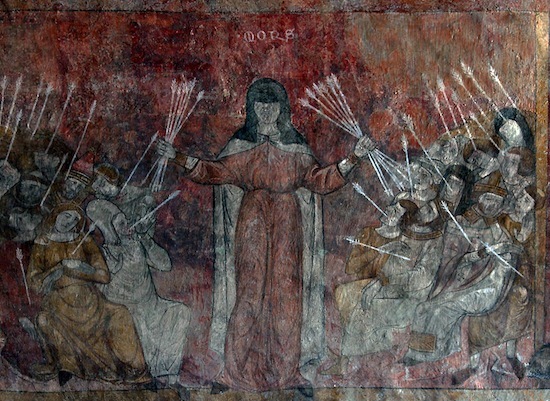 Fresco in the former Abbey of Saint-André-de-Lavaudieu, France, 14th century, depicting the plague personified as a woman, she “carries arrows that strike those around her, often in the neck and armpits—in other words, places where the buboes commonly appeared” (Franco Mormando, Piety and Plague: from Byzantium to the Baroque, Truman State University Press, 2007). The Black Death arrived on European shores in 1348. By 1350, the year it retreated, it had felled a quarter to half of the region’s population. In 1362, 1368, and 1381, it struck again—as it would periodically well into the 18th century. The contemporary Sienese chronicler, Agnolo di Tura del Grasso, described its terror. A victim first experiences flu-like symptoms, and then sees a “swell beneath their armpits and in their groins.” Agnolo himself buried his five children with his own hands. He also lost his wife. The plague hit hard and fast. People lay ill little more than two or three days and died suddenly….He who was well one day was dead the next and being carried to his grave,” writes the Carmelite friar Jean de Venette in his 14th century French chronicle. From his native Picardy, Jean witnessed the disease’s impact in northern France; Normandy, for example, lost 70 to 80 percent of its population. Italy was equally devastated. The Florentine author Boccaccio recounts how that city’s citizens “dug for each graveyard a huge trench, in which they laid the corpses as they arrived by hundreds at a time, piling them up tier upon tier as merchandise is stowed on a ship. Growing stability in Europe in the late middle ages made possible extensive trade between East and West and within Europe itself. Italian city-states such as Venice and Genoa had trading ports in the eastern Mediterranean and the Black sea—trade that made these cities among the wealthiest cities in Europe. Most historians today generally agree that the plague was likely spread through Eurasia via these trade routes by parasites carried on the backs of rodents. The bacterium Yersinia pestis (and not all historians agree this was the culprit) likely traveled from China to the northwestern shores of the Caspian Sea, then part of the Mongol Empire and by the spring of 1346, Italian merchants in the Crimea, specifically the Genoese-dominated city of Kaffa (today Feodosiya in the Ukraine) brought the disease west. Rats carrying infected fleas boarded ships bound for Constantinople (today Istanbul in Turkey), capital of the Byzantine Empire. Inhabitants there were sickened by the plague by early July. From these Greek-speaking lands, the plague spread to North Africa and the Middle East with terrible consequences; by autumn 1347, it had reached the French port of Marseilles and progressed both north and west. By early November, the Italian city-states of Genoa, Pisa, and Venice—commercial hubs for European trade—had been struck. Most of the rest of Europe followed in short order. The disease spread along the active trade routes that northern Italian and Flemish merchants had developed. London and Bruges then communicated the disease via busy shipping lanes to the Nordic countries and the Baltic region (aided by a trading partnership known as the Hanseatic League). Western crusaders seeking to attack the Holy Land prompted innovations in shipbuilding and these larger and faster ships carried large quantities of goods over extensive trade networks— but they also carried the deadly pathogen. With so many dead and dying, patterns that had kept medieval society stable were replaced by hostility, confusion, greed, remorse, abuse—and, at times, genuine caring. Contemporary chronicles tell of eruptions of violence, “Christians massacred Jews in Germany and other parts of the world where Jews lived, and many thousands were burned everywhere, indiscriminately,” wrote Jean de Venette, describing a ritualized attacks against Jews who became scapegoats. Some Christians became more pious, believing that their piety might endear them to a God who they believed had sent the plague to punish them for their sins. Texts from this time describe Penitent pilgrims, at times flagellating themselves with whips, crowding the roads. Others reacted by assuming a no-holds-barred attitude toward life, giving “themselves over to pleasures: monks, priests, nuns and lay men and women all enjoyed themselves….Everyone thought themselves rich because he had escaped and regained the world,” according to Agnolo. The Black Death turned the economy upside-down. It disrupted trade and put manufacturing on hold as skilled artisans and merchants died by the thousands—not to mention the customers who bought their wares. Workers’ wages skyrocketed as arable land lay fallow; landlords, desperate for people to work their land, were forced to renegotiate farmers’ wages. Famine followed. Widespread death eroded the strict hereditary class divisions that had, for centuries, bound peasants to land owned by local lords. People struggled to understand what was happening. In Western Europe a terrified populace often turned to their Christian faith. As a result, the Church became wealthier as many of those stricken, in an effort to assure a place in heaven, willed their property to the Church. But the authority of the Church also suffered. as some pointed to the “astrological skies that revealed Saturn in the house of Jupiter” as the cause of the tragedy. Did the Black Death contribute to the Renaissance? The Black Death radically disrupted society, but did the social, political and religious upheaval created by the plague contribute to the Renaissance? Some historians say yes. With so much land readily available to survivors, the rigid hierarchical structure that marked pre-plague society became more fluid. The Medici family, important patrons of Italian Renaissance culture, originated in the rural area of Mugello in Tuscany and moved to Florence soon after the plague. They initially established their fortune in the wool trade and then branched out into banking. As the family achieved wealth and power, they promoted such artists as Filippo Lippi, Sandro Botticelli, and Michelangelo—not to mention producing four popes and two regent queens of France. Would such mobility have been possible without the social and economic upheaval caused by the Black Death? Historians will likely debate this question for many years. Cite this page as: Louisa Woodville, "The Black Death," in Smarthistory, December 30, 2015, accessed April 24, 2019, https://smarthistory.org/the-black-death/.